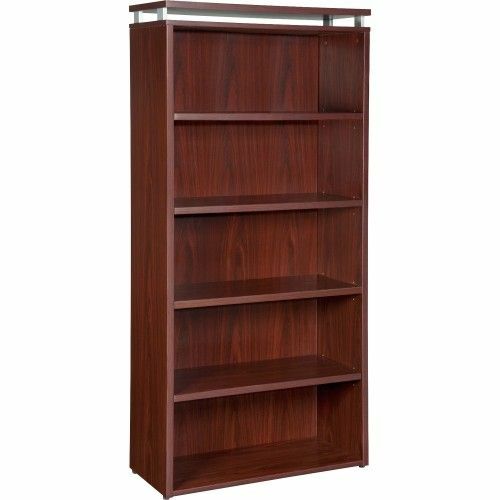 Five-shelf bookcase offers versatile storage options with sturdy, open shelves and is part of Lorell Ascent and Concordia Series Laminate Furniture with contemporary-style laminate and raised floating tops. Mahogany laminate top, back and side panels are 1" thick for durability as well as stain-resistant and scratch-resistant. The top is supported by aluminum brackets to provide the floating top look. All but the bottom shelf is adjustable. Each shelf holds up to 44 lb. (20 kg.). Design also includes 3mm PVC edges (color-matched) and adjustable floor glides for stabilization.